Your brochure can have a profound impact on potential clients, but only if it's done properly. A well-designed veterinary hospital brochure uses professional photos and compelling text to communicate your core values and key benefits. The experienced design team at VetNetwork knows how to combine all the essential elements to create an effective and professional-looking brochure for your veterinary hospital that brings pet owners right to your door. Flyers are an inexpensive and easy way for you to communicate with pet owners. A veterinary marketing flyer is a great tool for announcing hospital events, new services and staff, and reinforcing your brand. 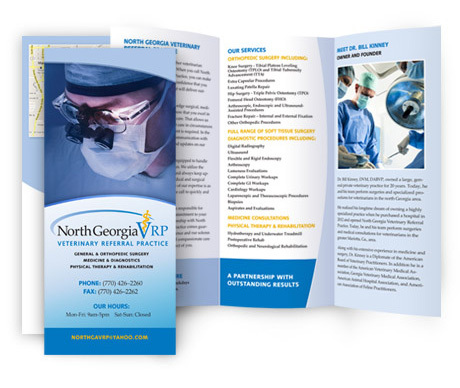 Flyers can also be used to convey information about medical procedures, vaccine protocols, preventive care techniques, and recommended wellness services in a quick, memorable way. Even in today's technology-driven world, don't underestimate the value of a colorful, interesting and professionally designed veterinary brochure or flyer for attracting new clients to your practice. Start your brochure or flyer today by calling VetNetwork at (800) 564-4215 or contact us online.